A few weeks ago the church had a boom lift parked right outside. 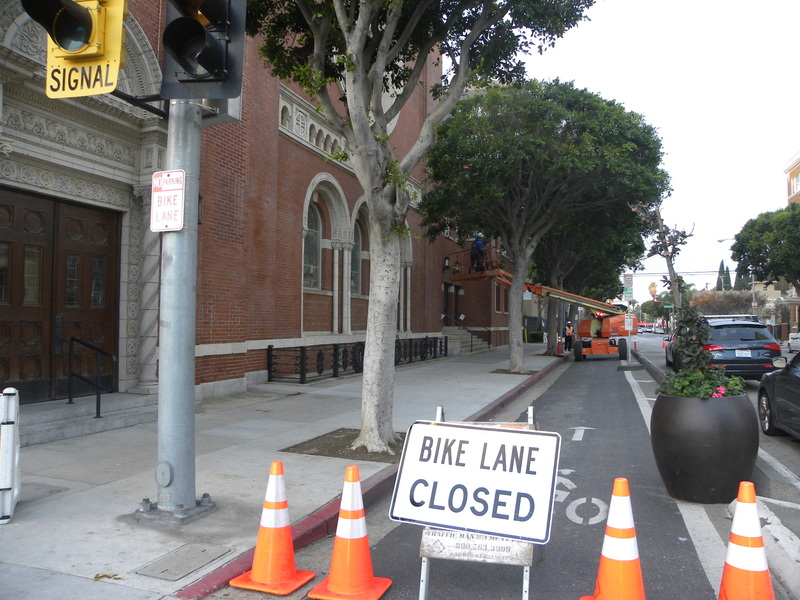 The city permitted the lift to block the bike lane on 3rd St. and the street parking on Cedar Ave. for only two days. Unfortunately, it happened to be raining sporadically those days so our team had to construct a little enclosure so that they could conduct their survey. 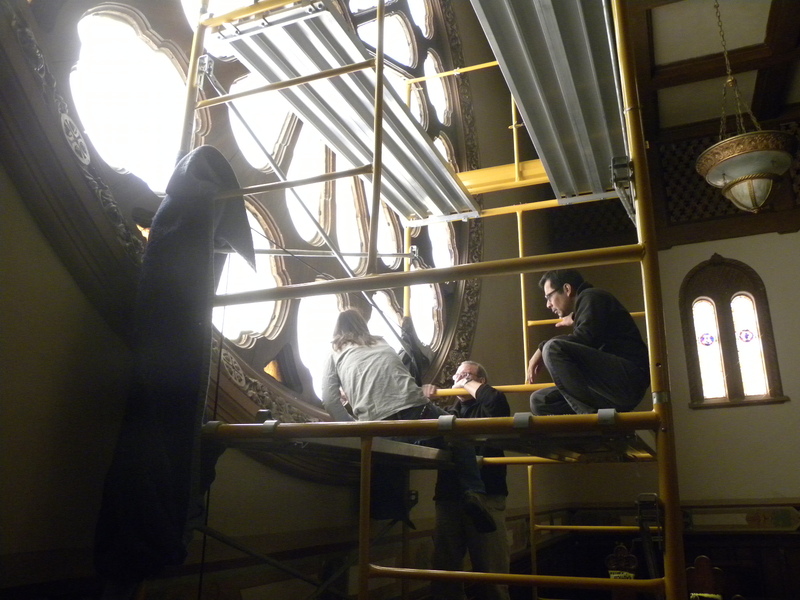 Before the boom lift was delivered we met with conservators from Rosa Lowinger and Associates to examine the interior of the window to see what we could discover by potentially removing a small portion. The structural engineering team vetoed this idea citing that the wooden frame was, however inappropriately, carrying the load of the terracotta. So no information could be gained from the interior. 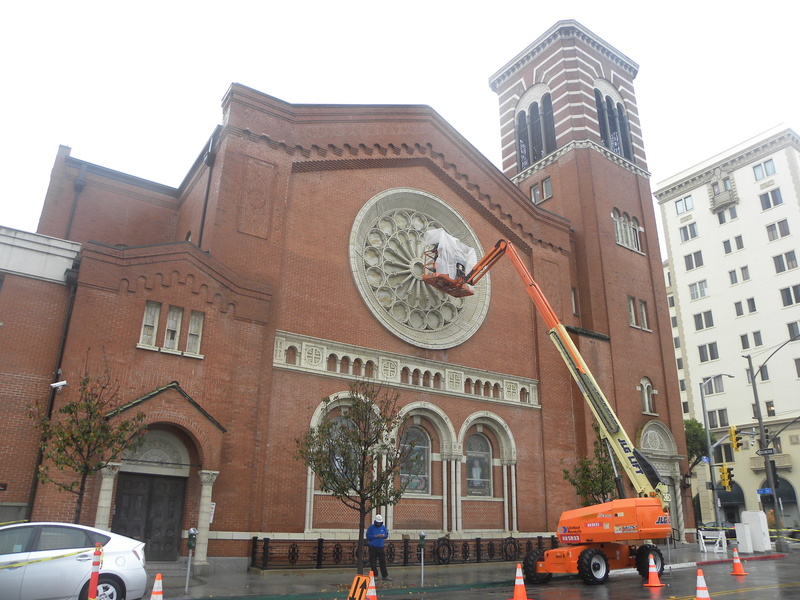 The following two days a boom lift was employed on the 3rd St. and Cedar Ave. sides of the building to document every crack in the brick and terra cotta exteriors. 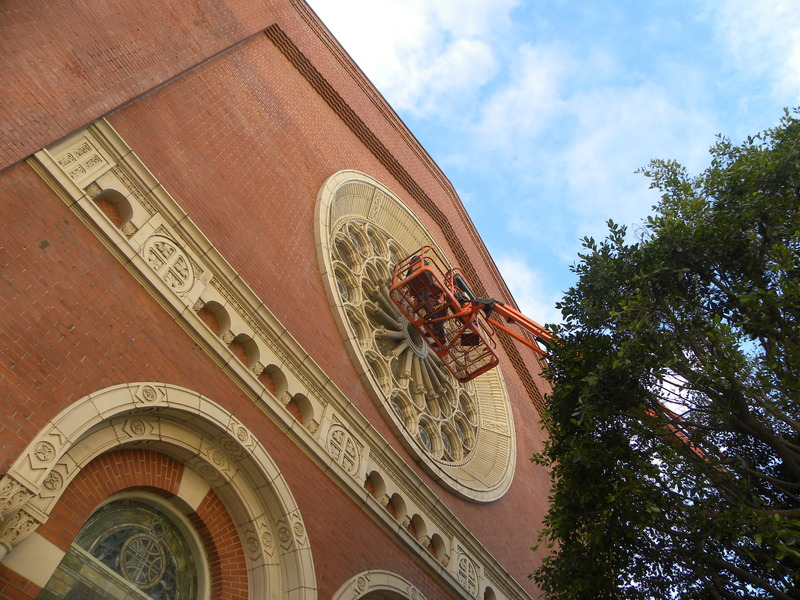 Using a special metal detector called an Elcometer Protovale Imp metal detector, metal armatures were found at the connection points of the terra cotta blocks in the rose windows tracery (See prior post for schematics). Corrosion of these interior armatures is a significant cause of cracking in the hollow blocks that cannot expand to accommodate the change of the size of the metal. Mapping the damage allows our team to locate the areas that are structurally compromised and helps them design an appropriate solution to mitigate the damage. Stay tuned for more details! This is the first time we have been able to examine the north side because the trees were recently trimmed back.